The Isothermal Regional Economic Development Strategy identifies Agriculture as a Target Industry Cluster. More specifically, the strategy describes action steps to increase the export value of agricultural products in our region by 5%, increase the number of local food outlets by 10%, grow the number of agricultural producers by 10%, and increase collaboration among industry stakeholders by 2022 through a focus on production agriculture. What are the Agriculture Economic Development Metrics for our Region and our Counties here in the Isothermal Region? For this information, we will use County Ag Profile info-graphics from the Center for Environmental Farming Systems (CEFS) to provide a visual interpretation of the 2007 & 2012 Census of Agriculture data, which is collected and maintained by the U.S. Department of Agriculture for all 100 counties in North Carolina. 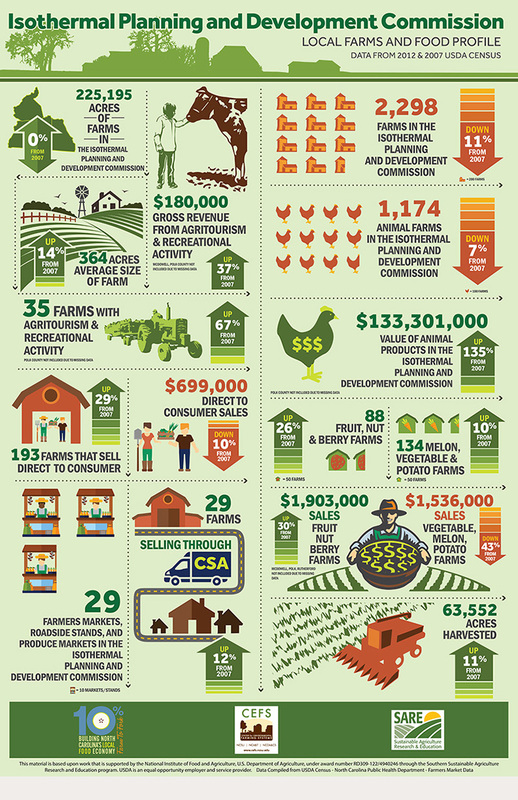 The info-graphics are intended to provide each county and council of government region with a simple, clear snapshot of local agriculture and the many ways in which it impacts local economies. The link to these graphics across North Carolina can be found here. The Ag Profile for the entire Isothermal Region can be found on that page and below. For additional, more current local context, the Appalachian Sustainable Agriculture Project (ASAP) reports the findings from an analysis of primary data exploring changes in the growing practices of farmers producing food for local markets in Western North Carolina from 2008 to 2016 found here and a 2017 Produce Survey Report found here. The Commission’s partner, NC Rural Center, has partnered with USDA to launch the Rural Food Business Assistance Project. The Rural Food Business Assistance Project provides direct technical assistance and training to agribusinesses and builds regional support networks of organizational stakeholders supporting local farmers, value-added processors and food service businesses. Click here for more information. U.S. Department of Agriculture (USDA) today announced the results of the 2017 Census of Agriculture, spanning some 6.4 million new points of information about America’s farms and ranches and those who operate them, including new data about on-farm decision making, down to the county level. Information collected by USDA’s National Agricultural Statistics Service (NASS) directly from farmers and ranchers tells us both farm numbers and land in farms have ongoing small percentage declines since the last Census in 2012. To view the press release from USDA, go here.